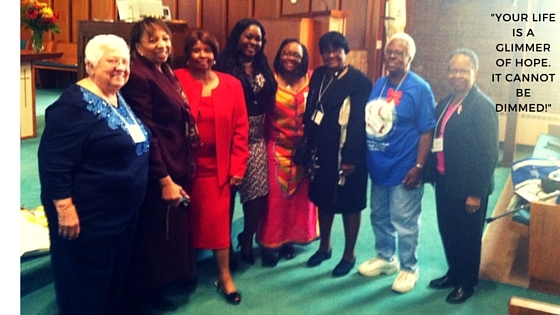 On October 10, 2015, I was invited to share a message with the United Methodist Women of the Detroit Renaissance District. It was humbling to speak to so many dedicated women of faith from all over the state. Sometimes we all need a little encouragement to help ignite our faith to endure the test and trials of life. I thank God he trusts me enough to minister over the men and women of God to help instill the HOPE they need for their journey’s in life. A lot of people are trying to have faith and they don’t even have HOPE these days. Hope is the ability to have only positive expectations, despite your current circumstances. My mission was to inspire and motivate the women of God to triumph over the enemy. The thoughts you think are more powerful than the words you speak. Whatever you feed your attention to will consume you. You have to focus on the positive things in life. You may not feel blessed but once you finally get a picture of it, your life will start moving towards those blessings of greatness. Weeping may endure for the night, but joy will come in the morning. We have to be prisoners of HOPE. We waste enough of our time being negative, critical and discouraging. The enemy is going to attack you… you’re in the army of GOD. You are going to have problems… but this too shall pass. It’s not our circumstances that steals our joy, it’s our attitude towards our circumstances that steals our joy! Our joy cannot be attached to our circumstances – because they change. We must hold on to our joy in the Lord – because he never fails, he never changes, he will open up the windows of heaven and pour out a blessing you don’t even have room to receive! Your greater is coming. All you need is a glimmer of HOPE! Because, you can do all things through Christ which strengthens you. Lord God, I pray that you fill our hearts with joy and peace today, so that in unity we may overflow with Hope for the future. Father, restore us and cause Your face to shine upon us and we shall be saved. For you are a merciful God, and hear all of our prayers. Because it is in Christ, that we can do all things which strengthen us. In Jesus name, we pray. Amen. Previous Previous post: Join me…Only two weeks until my Official Triple Launch & Book Signing!